This dramatic figure group represents S. Veronica offering the sudarium to Christ on the road to Golgotha, and was probably once part of an elaborate Late Gothic retable. Winged altar-pieces of this type may have had as many as fourteen or fifteen sections integrating both panel painting and sculpture within an architectural enframement. Christ's Passion was a frequent subject of these altarpieces. 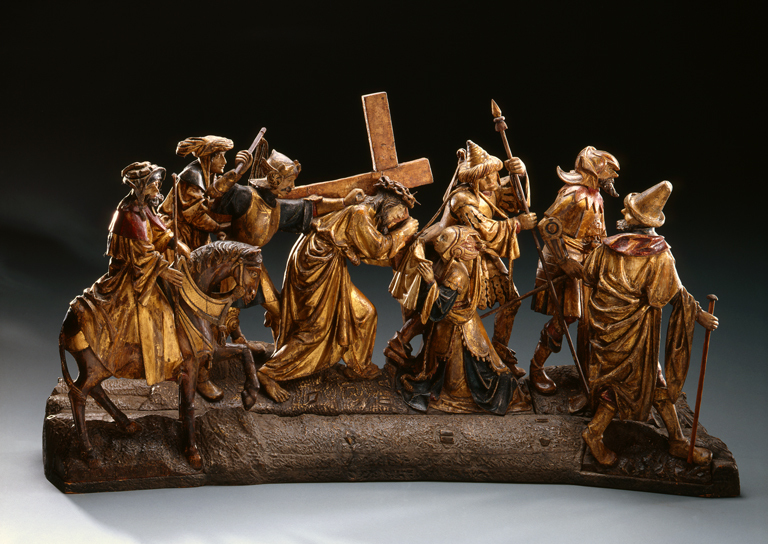 Scholarship suggests that changing liturgical practices in Antwerp and Brussels aimed at increasing audience involvement were the catalyst to the creation of these large-scale sculptural programs that so realistically and poignantly depicted Christ's Passion. Winters, Laurie et al., A Renaissance Treasury: The Flagg Collection of European Decorative Arts and Sculpture. New York: Hudson Hills Press, 1999, p. 140, cat. 69, color illus. p. 141. Goldstein, Rosalie, ed. Guide to the Permanent Collection. Milwaukee, Wisconsin: Milwaukee Art Museum, 1986, p. 23, b/w illus. p. 23.